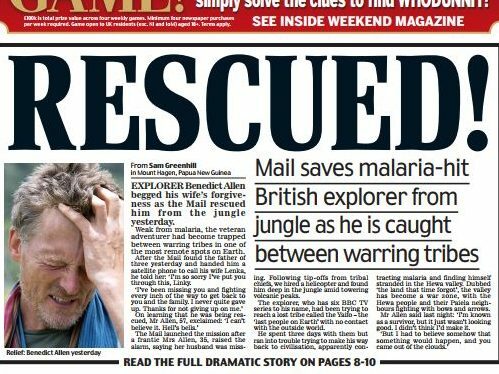 The Mail on Sunday appeared to pour cold water on Saturday’s Daily Mail front page account of its role in the rescue of explorer Benedict Allen from the jungle in Papua New Guinea. 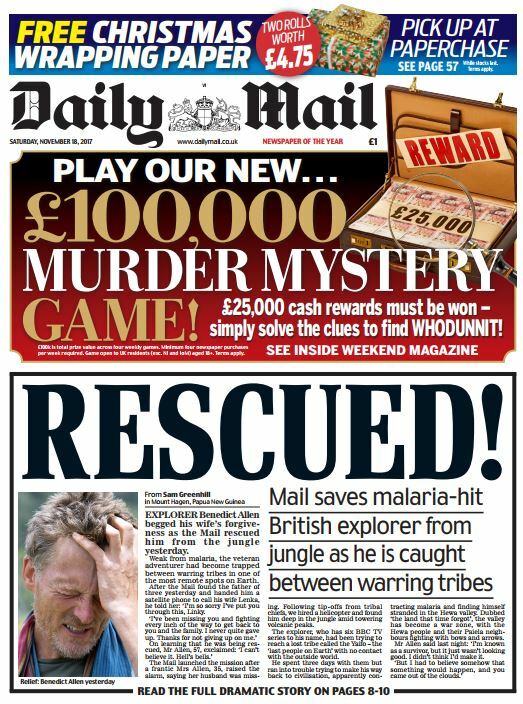 The Daily Mail ran with the headline “Rescued!” on Saturday’s front page and said: “Mail saves malaria-hit British explorer from jungle as he is caught between warring tribes”. 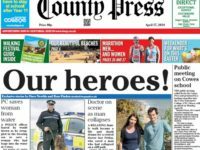 The paper said it had chartered a helicopter to find the missing adventurer, after he failed to show up for a flight to Hong Kong on Remembrance Sunday, and found him on Thursday last week. “When the Mail finally found him… it was immediately clear that everyone’s worst fears were well-founded. For Benedict was fast giving up hope of ever seeing his young family again after finding himself caught up in a tribal war and struck down by malaria,” said the paper. A picture of Allen, who has made programmes for the BBC, with reporter Sam Greenhill handing him the satellite phone in Papua New Guinea was included in the Daily Mail’s coverage. 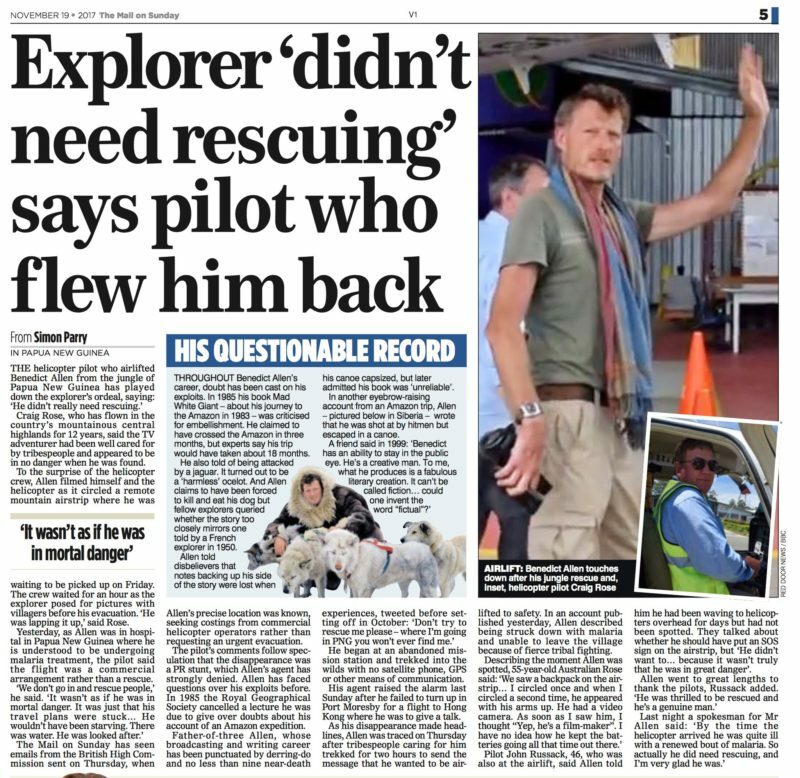 But, the Mail on Sunday yesterday carried a report from the helicopter pilot who flew Allen out of the jungle claiming the explorer “didn’t need rescuing”. 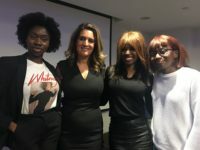 The Mail on Sunday said it had seen emails from the British High Commission, once Allen’s location was known, seeking costings from commercial helicopter operators rather than requesting an urgent evacuation. Both articles have been published by Mail Online. The Daily Mail today ran a story claiming Allen had made a “video will” fearing the malaria he had contracted would kill him. Daily Mail editor Paul Dacre is also editor-in-chief of Mail on Sunday publisher DMG media. The Mail on Sunday is edited by former Tatler and Evening Standard editor Geordie Greig. While Dacre backed Brexit in the Daily Mail, Greig urged his readers to vote Remain. Highly authoritative post Pat, apart from the facts: Doctors said if he had suspected malaria then he needed medical treatment as soon as possible, Benedict himself tweeted he did need rescuing and earlier had thanked the paper for doing so, and above all it seems unlikely that the Daily Mail journalists forced him to board the helicopter. But as journalists used to say “never let the facts get in the way of a story’, or in this case your comment. That aside though is it helpful for any of us in this day and age of battling accusations of ‘fake news’ for one paper to rubbish another papers story for internal political reasons?